A court in Cairo rules that it has no jurisdiction over a lawsuit calling to end the peace treaty between Egypt and Israel. The Cairo Administrative Court ruled on Tuesday that it has no jurisdiction over a lawsuit demanding the cancellation of the 1979 peace treaty between Egypt and Israel. According to a report in the Egyptian daily Al-Masry Al-Youm, the court said the issue involves state sovereignty, which is under the president’s purview. The plaintiffs said Egypt should void the peace deal over what they claimed was Israel’s ongoing destruction of Islamic holy sites and its refusal to stop building Jewish homes in Judea and Samaria. The plaintiffs claimed Israel’s refusal is a violation of United Nations conventions and the peace treaty itself. The court handed out the same ruling in a similar case last October, reported Al-Masry Al-Youm. The peace treaty between Egypt and Israel was signed in 1979 between Egyptian President Anwar Sadat and Israeli Prime Minister Menachem Begin. It was maintained during President Hosni Mubarak’s regime. The rise of Muslim Brotherhood member Mohammed Morsi to power, however, has caused concern that the treaty would be amended or cancelled. While Morsi has repeatedly said he would continue to maintain the peace with Israel and uphold international documents signed by prior Cairo administrations, he has mostly given Israel the cold shoulder since taking office. In November, Morsi recalled the Egyptian ambassador to Israel in protest of Israel’s counterterrorism Operation Pillar of Defense in Gaza. Last October, Egypt rejected an Israeli request to upgrade the relations between the countries, after the Jewish State expressed interest in expanding the cooperation between the two countries and raising it to a level of ministerial talks between Defense Minister Ehud Barak and his Egyptian counterpart. At the same time, security cooperation between the countries has continued and reports last week indicated that Egypt will be sending a security delegation to Israel, for the first time since Morsi’s election. Since Mubarak’s ouster there have been growing calls by the Muslim Brotherhood to amend the peace treaty with Israel. One official with the Muslim Brotherhood even said that the peace accord between Israel and Egypt has caused Egyptians to suffer from “endemic diseases”. Meanwhile, reported Al-Masry Al-Youm, a member of the Muslim Brotherhood’s Freedom and Justice Party figure said Tuesday that the party’s legal committee is working on a new draft law to amend the peace treaty. The member, Osama Suleiman, said the draft law will be sent to Morsi, so he and the new parliament can review it after the April-May elections. The draft law will amend the treaty so that Egypt’s Armed Forces can gain full control over the Sinai Peninsula, Suleiman added. The 1979 peace treaty bans Egypt from sending armed troops into the Peninsula, allowing only Egyptian police with light weapons to guard borders with Israel, except in special cases. 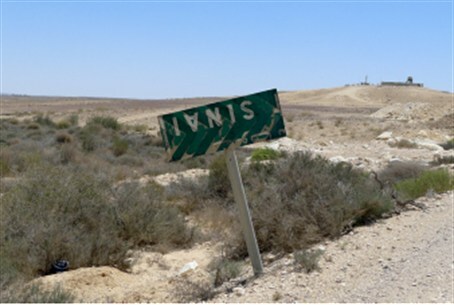 Security in the Sinai collapsed and lawlessness took over after the uprising which ousted Mubarak in February 2011. Egyptian security forces launched a campaign to crush terrorists in the restive Sinai, after an attack on an army outpost killed 16 soldiers last August.